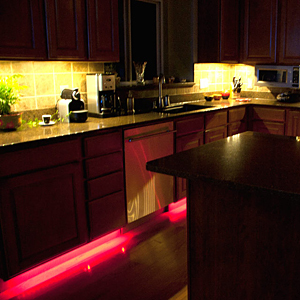 The strip lights are IP65 waterproof Color changing with 20 colors. 8 light pattern: Quick/ Slow/ Auto/ Flash/ 3 color jumpy change/ 7 color jumpy change/ 3 color fade change/ 7 color fade change and R/G/B increase and decrease control. It is ideal for indoor and outdoor lighting decoration, such as kitchen, under cabinet, dining room, bedroom,TV Backlighting, automobile, mirror, balcony,party, patio, automobile, wedding, etc. 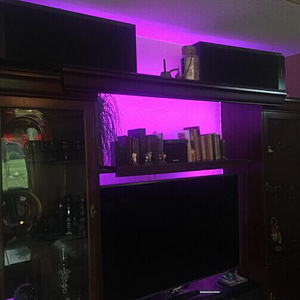 What You Get : Comes with 16.4ft/5M RGB LED strip, 12V/5A power supply, IR box controller, 44 key remote controller and connectors. No more accessories are required. 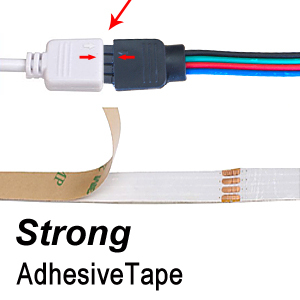 Just tear tape behind the strip light and stick it to wall or other surface, you'd better use blown-sponge (not included in the package) if the surface is rough. Do not worry about the installation.You just need to insert the plug. all our strips circuit board is 100% DOUBLE-LAYER designed by professional factory, unlike most other single-layer ones; it could be seen that ours are more sticker and harder. Please Note: The arrows should be connected on the same line. If not, it won't work. 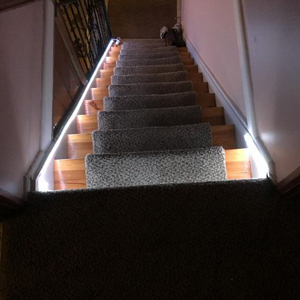 Led strip light can be cut between every 3 leds without damaging the rest strips. 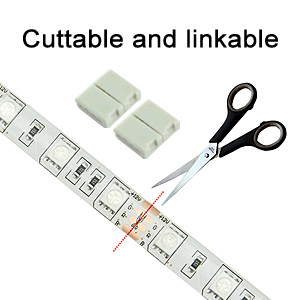 And we will provide 2 connectors for free that you can use to link the strip for DIY. It has 20 colors. 8 light pattern: Quick/ Slow/ Auto/ Flash/ 3 color jumpy change/ 7 color jumpy change/ 3 color fade change/ 7 color fade change and R/G/B increase and decrease control. The strip lights are IP65 waterproof Color changing,It is ideal for indoor and outdoor lighting decoration.